WNISAT-1 Launch Set for November 21 – Weathernews Inc.
Weathernews Inc.（Chiba, Japan; CEO: Chihito Kusabiraki) has announced the revised launch date for their ultra-compact satellite, WNISAT-1, to November 21st from the Yasny Cosmodrome in Russia. WNISAT-1 is currently awaiting shipping to Russia in late September for about a month of final preparations before the launch in this fall/winter season. 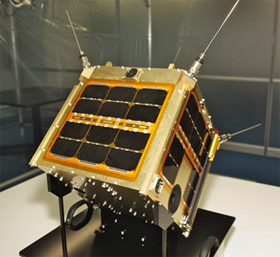 WNISAT-1 is an innovative satellite that eschews the conventional design conventions of large, multipurpose satellites. 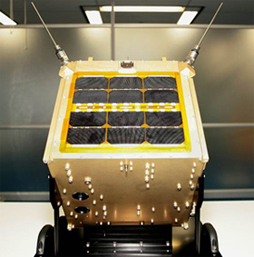 By limiting its main mission to Arctic sea ice observation, the designers were able to realize the satellite’s functions within a compact cube size to just 27 cm across and weighing only 10 kilograms. Also, so that operational costs incurred after launch time are appropriately economical, various innovative techniques have been developed by partners, AXELSPACE Corporation. The launch will be carried out by piggybacking WNISAT-1 onto a Dneper-1 rocket carrying a large conventional satellite into sun-synchronous orbit from the Yasny Cosmodrome near the border of Kazakhstan and Russia. The launch window for delivering Weathernews’ special payload into orbit will be about three weeks from the scheduled launch date of November 21st, depending on weather conditions. Recession of the ice extent in the Arctic Sea over the last few years continues unabated, and the Northern Sea Route is opening up to new commercial voyages. The passages are expected to open to commercial shipping traffic any day now. When a vessel sails via the Northern Sea Route, a voyage from Europe to Asia is only half the distance of a conventional voyage transiting the Suez Canal, and a third shorter than sailing around the Cape of Good Hope in South Africa. The possibilities of reduced costs of fuel consumption and burden on the environment mean the shipping industry has great expectations for this alternative route. Since 2008, a dedicated Global Ice Center team at Weathernews has been collecting data ice conditions around the world, and continue their activities for facilitating the use of the Northern Sea Route for the shipping industry through monitoring and forecasting ice in the Arctic Sea. The launch of WNISAT-1 is expected to open the possibility of real-time monitoring for even better accuracy forecasting the timing, location and concentration of sea ice. In addition to C02 monitoring, Weathernews also has various plans challenging the application of the sensors aboard WNISAT-1 to monitor other visible atmospheric phenomenon like cloud height, thunder/lighting and volcanic ash dispersal from space.